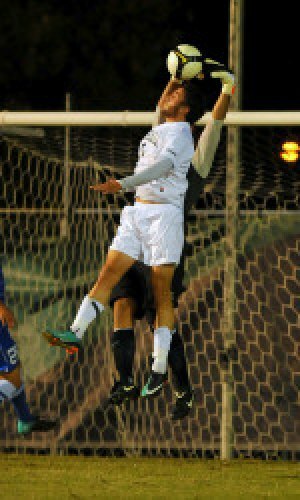 EAST LANSING, Mich.- It may have taken five games, but the Thundering Herd men’s soccer team is off the mark for 2011. After losing several heartbreakers by slim margins, junior Tom Jackson was on hand to score Marshall’s first goal of the season and lead the team to its first victory of the year over Michigan State. Jackson scored the game’s lone goal on a breakaway in the 33rd minute after sophomore Matt Risher played him through. Once in on goal, Jackson - the Herd’s leader in shots so far this season - made no mistake in placing his shot into the upper, right-hand corner of the net. Marshall’s good fortune came in the form of being outshot 13-7 by Michigan State while not conceding a goal. Goalkeeper Daniel Withrow played a large part in that effort with 5 saves on the afternoon. Following the victory, Marshall moves to 1-4 on the young season. Michigan State, meanwhile, falls to an identical 1-4 record. “We take a well-deserved day-off tomorrow and we go back to work on Tuesday as we look forward to two home matches this coming weekend,” said Olivier. Marshall’s next match is scheduled for this Friday against Oakland University at 7:00 p.m. The team will then battle Winthrop on Sunday at 1:00 p.m. Both games are set to take place at Sam Hood Field.